Chat banking in South Africa and Nigeria took off in 2016 and 2018, respectively. This happened primarily on Facebook Messenger. Yesterday's announcement by Nigerian banks will see it extend to Facebook's Whatsapp. 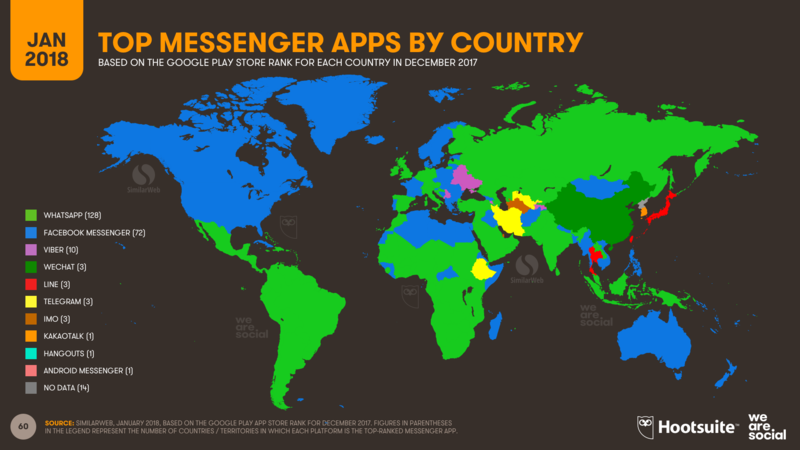 The two Facebook services combined dominate the instant-messaging market for Africa. Guaranty Trust Bank Plc, (GTB) was one of such banks to make the announcement yesterday to offer banking services on WhatsApp. They will leverage WhatsApp's business solution to offer their customers more communication channels. Business Post reports that this is in line with their efforts to enhance service delivery and banking experience. Users would be able to make inquiries and access to other basic banking services on the platform. Basic banking services include checking of balance, transfer of money and now, value-added services. Examples of value-added services include bills payments and airtime purchase. GTB's CEO, Segun Agbaje, explained that customer feedback was an important part of how they churn out products. So, preparing to launch a service that could make it easier for customers to give feedback seems logical. "...we are passionate about driving constant interaction with our customers to learn more about how we can serve them better. As well as to provide them with the financial solutions that can add real value to their lives. By leveraging the WhatsApp Business Solution, we are continuing to expand our service channels as part of our commitment to making banking... readily accessible to customers wherever and whenever they choose to bank. ", he said. Likewise, the United Bank for Africa (UBA) has also promised to extend the capabilities of their chat banker, Leo, to Whatsapp by September 1. With Leo on WhatsApp, customers will be able to carry out basic banking services, THISDAY reported. Their Group MD, Kennedy Uzoka said "our customers are at the heart of our business and we...are never relenting in matching our words with equal action". He adds that their "...aim is to make banking seamless and effortless for...millions of...customers". Leo which went live on January 11, 2018, has already raked in awards and recognition for the bank. Exactly 6 months after – July 11, they received the Euromoney award for Best Institution in Digital Banking. "...one bank stood out in the last year for the inventiveness of its efforts in digital banking: United Bank for Africa". He continues "one of its signature launches in Nigeria was Leo, an e-chat service using artificial intelligence to help customers execute transactions on Facebook". As expected, they will look to replicate the Leo Facebook Messenger success on Whatsapp. Their Online Banking Group Head, Austine Abolusoro asserts "...Leo...will replicate on WhatsApp, the success it has experienced on the Facebook Messenger platform". A South-African global messaging company, Clickatell is one of the handful of companies selected to become Whatsapp's Business Solution Providers. A Solution Provider helps provide the tools businesses to receive, store and send messages. They are responsible for making Whatsapp Business solution work for big businesses like banks. Their head office is in Silicon Valley, California, USA. But they have other offices in Toronto, Nigeria and Cape Town. Bonus: They are currently looking for a Project Manager in Lagos. Clickatell’s CEO, Pieter de Villiers reiterates their drive to become the go-to solution provider for businesses looking to deploy on Whatsapp. “...We are determined to be the go-to partner of choice for businesses globally,” he said. They have bundled their own SaaS solutions (Connect, Touch and Transact) with Whatsapp's API such that businesses making use of them can immediately begin making use of the Whatsapp Business Solution without having to do a lot of customisations. Their current customers include Absa Bank (owned by Absa Group Limited), GTB, UBA and FirstBank. While they have since concluded integrations with Absa Bank, the rest of the (Nigerian) Banks are still work-in-progress. Yesterday, Absa Group Limited announced that they had reached over 10,000 customers in just 3 weeks of launch – July 11. Their Chat banking service is reported to have sent 300,000 messages already. Users can check their account balance, buy airtime and make payments using natural language and short commands. The Group had launched its Chat banking service on Facebook Messenger and Twitter in 2016. According to Absa’s CIO Jacques Barkhuzien, it took the company two years to develop Chat banking on WhatsApp; and it was developed in partnership with Facebook and Clickatell, a global messaging company, African News Agency (ANA) reported. Soon, we expect that FirstBank Nigeria would announce [its plans for] similar implementation. Perhaps, they are just waiting to get further with their implementation which is has been "slow", according to a source familiar with the matter. "Apparently, we all haven't finished implementation. The technical partners, Clickatell haven't been helpful at all”, we are told. Following the announcement by GTB, and UBA we expect more tier 1 Nigerian banks plus large businesses to follow suit. But how fast can Clickatell deliver? Try out our Whatsapp Business API's Click-to-chat: +2347019215600.